The Dogs and Storm finished 1-2 in the regular season and now they've booked a Grand Final date with each other on the last Sunday in September. Our Grand Final Show is out Wednesday Night September 26! Now www.wdnicolson.com will be at ANZ Stadium on Sunday to take in not only the First Grade fixture but the Totoya Cup clash between Canberra and the Tigers and the NSW Cup GF between Newtown and the Tigers. While the 1st Preliminary Final was a rout thanks to Manly not showing up and Melbourne putting the lifeless Sea Eagles out of their misery 40-12, the 2nd Preliminary Final was a far better game and worth of the semi final stage as Canterbury overcame the Bunnies 32-8. NOT The Footy Show will have our entire panel's choices for the 2012 Premiership on Wednesday's Grand Final Episode 128 on iTunes. 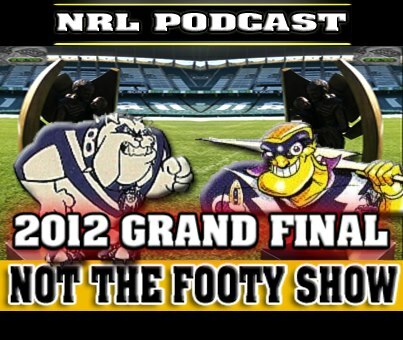 But in the meantime - here are www.wdnicolson.com's early views on the Grand Final combatants. CANTERBURY BULLDOGS into GF after beating Manly 16-10 and South Sydney 32-8. Don't get me wrong, the win over Souths was a good one but the Dogs lose their way late and that won't please coach Des Hasler. The Dogs have done what was required in their two semi finals but despite the final scoreline over Souths (32-8) they went away from the fight for everything approach in the last section of the game... chasing cheap points when a solid finish would have put them in a great position entering the Storm challenge. Sure there's always variables entering a decider but the Dogs have a game plan that can beat anyone but if they are off just a little bit at the start of the Grand Final - a team like Melbourne can shatter your self-confidence like no other team. That being said - the Dogs deserve to be here contesting the big one - and even with Melbourne holding the big game experience, the Dogs have got Ben Barba and Josh Reynolds, a duo who could turn the hard work of James Graham, Aiden Tolman and Sam Kasiano into another Canterbury premiership... but I think the Dogs need to start well to do so. MELBOURNE STORM into GF after beating South Sydney 24-6 and Manly 40-12. Have punished two very good opponents who handed them the match... was this team foxing by losing 5 straight later in the season? Well you'd have to say that coach Craig Bellamy wasn't trying to lose five in a row but the Storm are now on a 7 match winning streak and have played great footy in both semi finals and have been completed at 88% against Souths and 82% against Melbourne. Complete like that when your opposition hands you field position and plenty of the ball - and that's how you get into premiership winning form. That and having Cameron Smith and Cooper Cronk in stunning form and Billy Slater starting to run freely... Melbourne may only be even-money in the current market ($1.91 v $1.91) but right now I think they should be favourites. For a start they played their game right to the end and punished Manly... and the Dogs will be the media darlings this week as the only Sydney team - so Des Hasler will have more than just his team's preparation to deal with. Right now though, I believe it is Advantage Melbourne. For this week I'll be tapping into the betting mind of a maestro only known as 'Rainman' and he has the Storm favourites as well. WHAT ARE YOUR EARLY THOUGHTS ON THE GAME? Out Wednesday Night September 26 with Special Guest Luke Patten.